Successfully Added 1080P HD Camcorder (10x Optical Zoom, Pre-Record, Motion Detect) to your Shopping Cart. The image quality from this full HD camcorder is, simply put, breathtaking! The HD videos are so crisp, colorful, and vivid, that you will sometimes feel as if you are actually there! This is because the camcorder uses a dynamic 10MP (megapixel) image sensor with a native resolution of 1920x1080. This is the same video resolution used to create documentaries such as Discovery channel’s Planet Earth as well as the hit TV series American Idol. When the pre record function is turned ON, this HD camcorder will record video for a full three seconds before you even press the REC button! This is the first time this amazing technology has been introduced to the consumer market. This important feature will ensure you always capture those spontaneous moments you didn’t see coming - as well as provide you with the often forgotten “pre roll” time you will need for video editing. This HD camcorder comes with 10x optical zoom so you can capture subjects in perfect clarity from far away - such as small birds in a tree or people hiking to the top of a mountain. The optical zoom does NOT degrade the image quality like a digital zoom will do, so don’t be fooled by large digital zoom numbers, in the real world, optical zoom is what really matters! This is a great way to turn your camcorder into an all-in-one HD security system. Just place it in your bedroom or behind some books in your office and it will automatically record any moving object within the picture frame. This is the perfect way to catch unsuspecting intruders or criminals in the act - or, to simply record yourself without having to press the RECORD button every time. Additional features include: image stabilization for people with shaky hands, smooth slow motion recording to capture details such as individual rain drops or subtle facial expressions, and time lapse to record long events at a much slower frame rate (1, 3 or 5 frames per second). This will give you that artistic effect where the sun sets in less than a minute, or a flower blossoms in just a matter of seconds! If you’re in the market for a HD camcorder and want one with stunningly gorgeous video quality and professional features such as pre-record and 10X optical zoom, then this is definitely the right camera for you. It's currently in stock and ready for single piece or bulk orders. If you order now we will ship it out within 24 hours. Available only from the leaders in factory-direct wholesale electronics, Chinavasion. Use a Class 6 SDHC card for best results. When using the WVGA setting you can achieve 60FPS videos. Image stabilization will not be active during FHD(1920X1080)30FPS. Format your SD card first using the cameras own formatting option in the setting menu. Easily view your HD video on your HDTV by using the included HDMI cable. This is the best way to proudly display FULL HD video for your friends and family to enjoy! Can I upload the videos to YouTube? 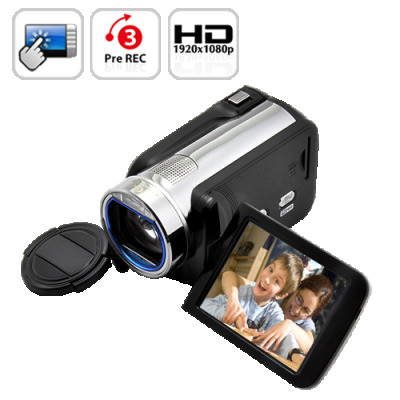 Yes, with this HD camcorder and the included software you can easily create videos for use with YouTube. How easy is it to playback my HD videos on my HDTV? Extremely easy. You can either connect the camcorder directly to your HDTV via HDMI cable and press PLAY, or transfer the HD files to your hard drive and view then directly on your computer monitor.